10 of the most 'A-MAZING' Corn Mazes in America! Corn. It's not just for shucking, "cob"-bing or popping anymore. As those tall, tasseled stalks reach high into the sky, they just invite you to lose yourself (think about those folks in "Field of Dreams"). So no surprise cornfields make for awesome mazes. Mazes have been a "thing" in one form or another since the time of the Greeks. Most of those were made from hedges or walls, and meant as a meditative or spiritual experience; these days, they're just for fun. Corn mazes have grown in popularity since the 1990s (and it's been a great way for farms to generate extra income). The designs can get crazy-complicated, and are months in the planning and preparation (often, relying on satellite views of the terrain to help). Most mazes provide a map (always a good idea, as some folks have been known to call 911 in a panic if they've been in there too long), and many offer signs with clues, even a number to text for "hints" to help you along. If you really want to take it up a notch, many farms make their mazes go "haunted" at night, where scary types leap from within the stalks to scare the bejeepers out of you. Or keep it simple with kiddie-level ones (most farms offer an option). 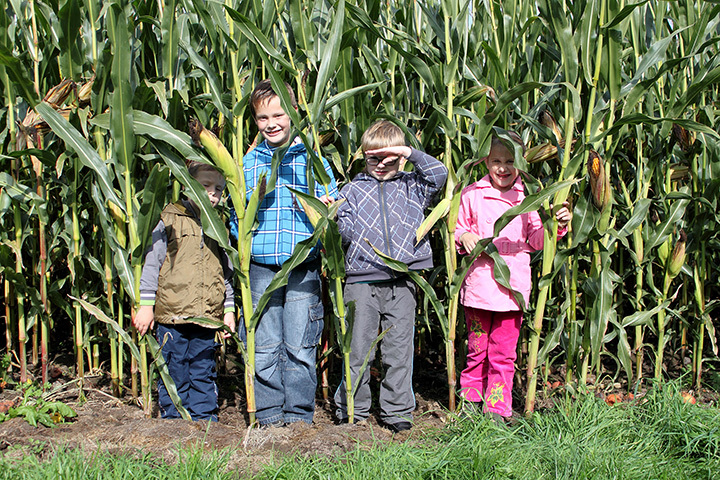 Whatever your style, corn mazes are great family fun and a terrific way to enjoy a beautiful autumn day. Here are ten of the best across the country. It's the largest maze in all of New England, and regularly ranks among the Top 10 in the country. This one, located on a 3rd-generation dairy farm covers about 10 acres, with stalks of corn towering 12 feet tall. But there are several elevated places (one being an old boat) that allow you to climb up and get your bearings. About an hour outside of Boston is this favorite fall destination. Set within the challenging maze are twists, turns and puzzles, plus a number of "bridges" that give you a chance to take in the whole picture -and take a break. One comes complete with an old-fashioned bucket and pulley that you "send down" to purchase a reviving snack. New Jersey's largest corn maze comes up with an interesting design each and every year. From the Civil War to native sons (like Sinatra) to the anniversary of Rutger's University, there's always a new challenge. Up the ante by playing "Maize-opoly" as you earn pretend money while navigating the 10-acre maze. Near Orlando lies another "happiest place on earth" - this popular seasonal attraction. It offers both a 1-acre and 7-acre maze challenge, with great designs that range from a patriotic salute to the troops to an appreciation of farmers. Theirs is one of the biggest mazes in the world, and is broken down into five different "games" winding through intricately planned 33 acres. The easiest game will take you only about 20 minutes to solve; the longest is about 2 hours. The farm has been in the same family for over a century - and they lovingly create some of the most intriguing corn mazes anywhere. At 15 acres, it's the biggest one in Wisconsin, and has been listed among the 10 Best in America by USA Today, The Travel Channel and more. For nearly two decades, families in the Twin Cities have headed here to get their maze on. Besides fun designs, those who successfully solve the maze "puzzles" are entered into a grand-prize drawing. Just call it "cash for corn." It's billed as "Idaho's original corn maze," and draws thousands every year who enjoy stumbling through its 18 acres. Super-creative mazes have been built around themes ranging from "The Wizard of Oz," Peter Pan, John Wayne and various sports teams. If you get lost, "Corn Cops" are there to help get you outta there - and there's a "Mini Maze" for little ones. For 30 years, the Studt family have designed and personally cut an assortment of fun, challenging mazes. They usually offer up three types, catering to kids, adults and those who want to be spooked in the dark. No wonder the place has been ranked as having the best corn maze in the state. The Cooley Brothers think big - really big. Their original corn maze is in the Guinness Book of World Records as the world's largest -a whopping 60 acres. Each year, they cut an intriguing new design; sponsors like Starbucks set up "checkpoints" along the way to help navigate it. But there's also GPS for those with a lousy sense of direction.